After a 270 yard drive on the 560-yard par-5 first, Dahmen chipped his fourth shot to 7 feet, which he rolled for two-putt bogey on the hole. 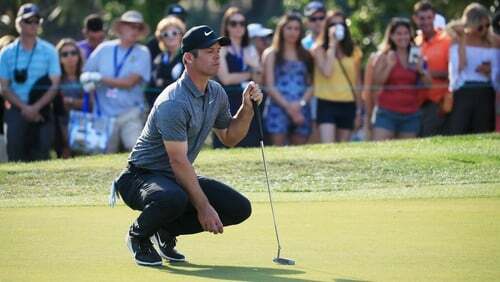 Defending champion Paul Casey fired a five-under par 66 to grab a share of the 36-hole lead alongside American Austin Cook at the PGA Tour's Valspar Championship on Friday. It was the second albatross in a week on the PGA Tour, after American Harris English recorded one at the Players Championship. So it's kind of fun, first time in Bay Hill, first time Players, first time here. The Englishman led by three from Dustin Johnson and Jason Kokrak but saw that lead cut as he dropped a shot at the last while world number one Johnson escaped from a fairway bunker to make birdie, leaving him eight under par with Casey nine under. "This was a huge kick start and all of a sudden the smile on my face got a little bigger and I was able to hit some good shots", said the two-times PGA Tour victor. "I played today quite aggressively and tried to take advantage of the golf course that I knew was going to get very, very tough this afternoon". "Nice to turn it around after last week to suddenly be not in control of this event but I'm near the top, which is good". But the most memorable shot came from Knox on the par-5 11th hole. "It's a good way to go from plus two to minus one very quickly", Knox said. "I feel really good about (my game) because last week was rubbish", said Casey, who was stung by a missed cut at the Players Championship at TPC Sawgrass. "Didn't even have to putt, which was great". "I would have been delighted with a birdie". "I think that puts me in a more relaxed frame of mind". Straka and Dahmen also played in the morning on a day when almost all the best scores were posted early, before a breeze and firm conditions created a stern afternoon test. Just two back to start the day, he'll start Sunday 10 behind thanks to a scorecard that included seven bogeys.